Collecting tabs from aluminum pop cans is simple for you to do and a great way to help your local Ronald McDonald House. Not only are you helping the families who stay at the Ronald McDonald House Charities of Huntington, Inc., but also you are being presented with an opportunity to teach children the value of service to the community. 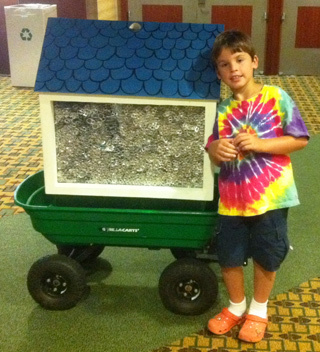 The funds gathered from collecting and recycling pop tabs go directly to the Ronald McDonald House Charities of Huntington, Inc.. Be sure to keep an eye out for collection containers in the shape of a house at schools and other local organizations. You can also contact us if you are interested in getting your own house container to being collecting.